Because...seriously...who doesn't love a gift involving chocolate?!?! These might be especially appropriate for those friends you may have who have a hard time on Valentine's Day. It seems Dementors are our full force on Valentine's Day and seem to concentrate among those who don't have a particular Valentine with whom to celebrate. 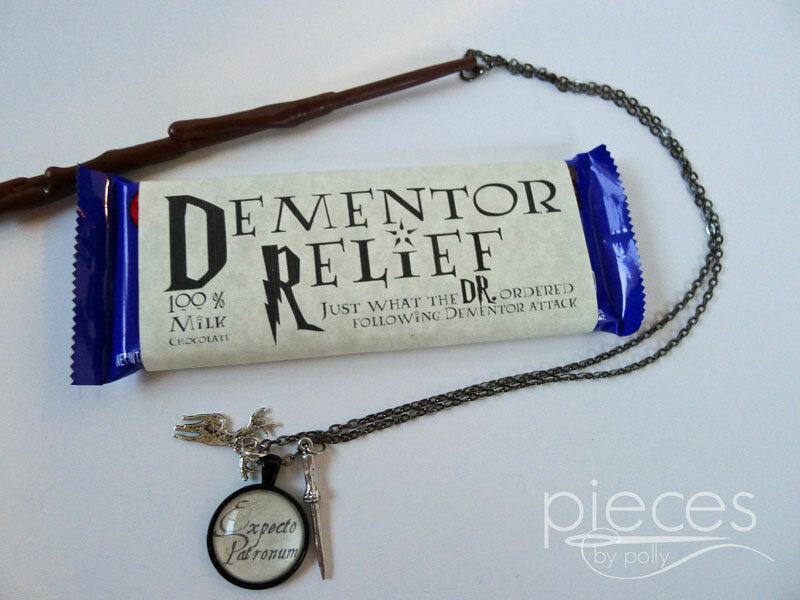 So a little Dementor Relief is sure to be appreciated..."Just what the DR. ordered following Dementor Attack"
For those larger dementor attacks, though, you'll want to reach for a big Dementos Bar. 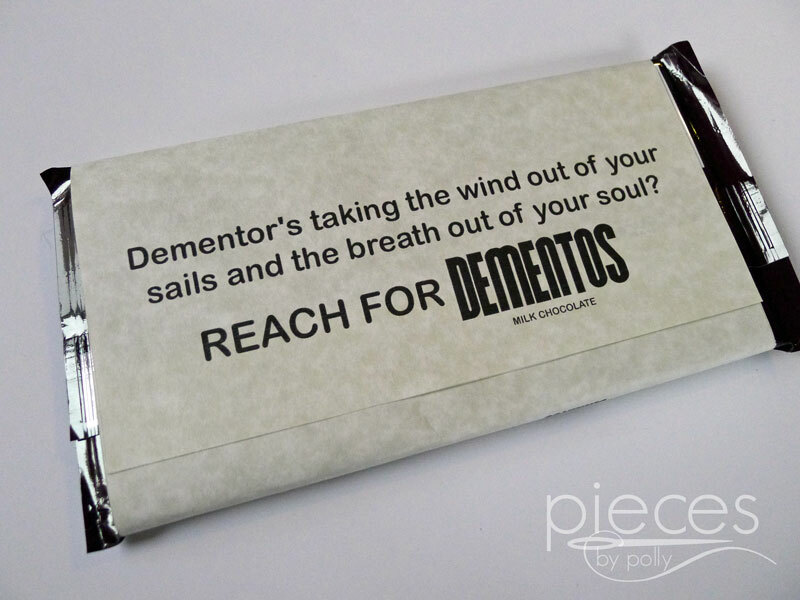 "Dementor's taking the wind out of your sails and the breath out of your soul? Reach for DEMENTOS! I have to thank my brother David, for the creative geneous behind the Dementos Bar name and slogan. It's no wonder he works in PR. 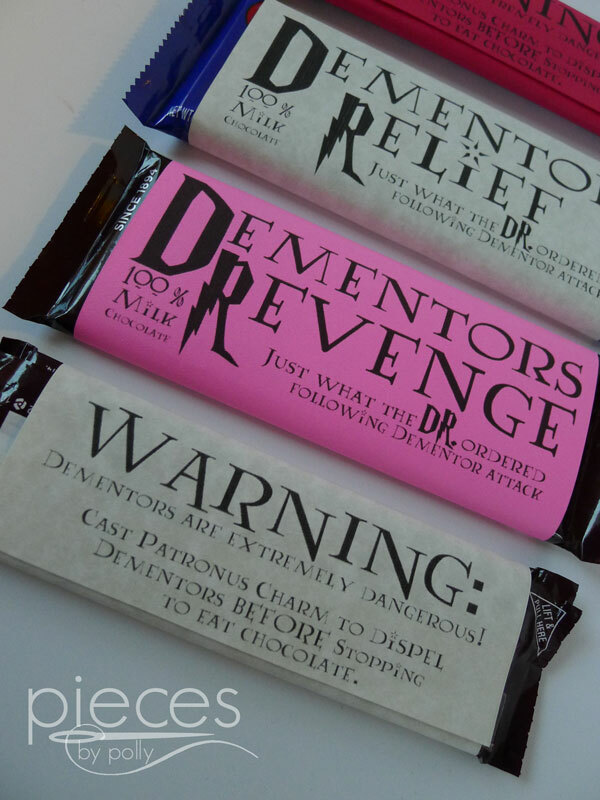 I'd originally designed the Dementor's Revenge wrappers thinking that feeling better would be our revenge upon the dementors, but the Hubby and my brother thought they were too confusing, so we came up with Dementor Relief and Dementos as alternatives. 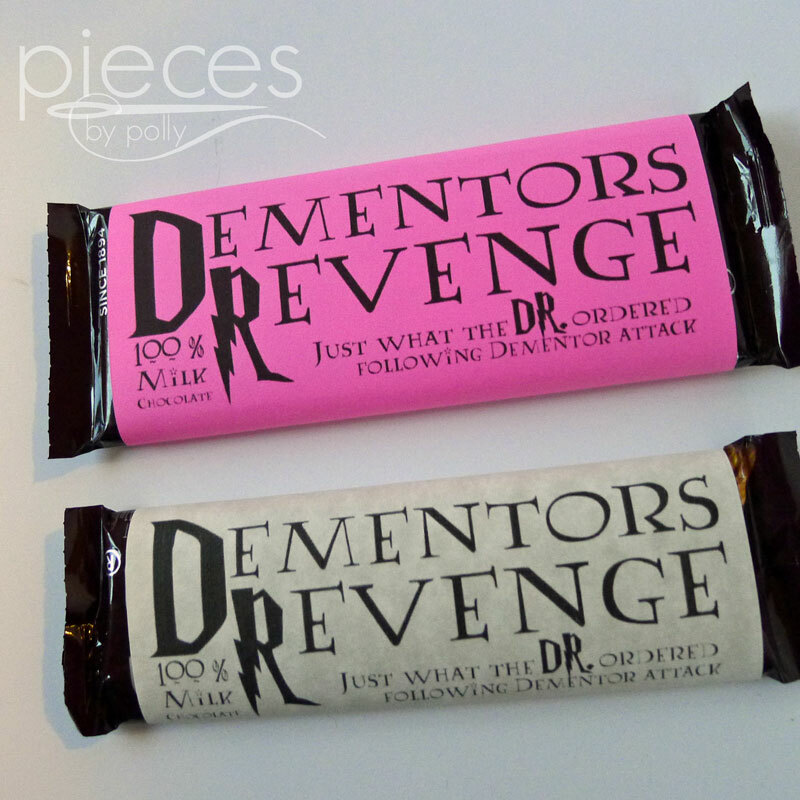 Since I already had the Dementors Revenge Wrappers designed, though, I figured I'd go ahead and make them all available...cause I think Dementors Revenge is a great name brand for chocolate. 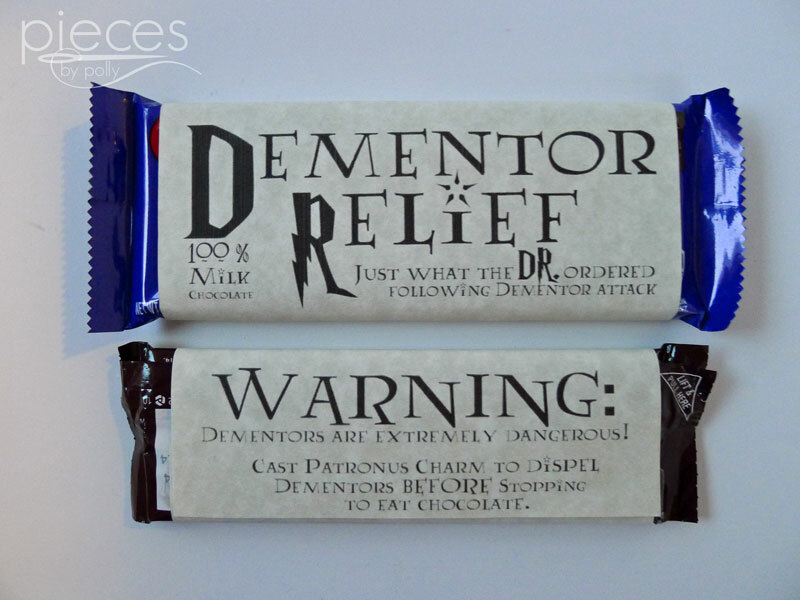 The Dementor Relief and Dementors Revenge are available for the smaller size candy bars. 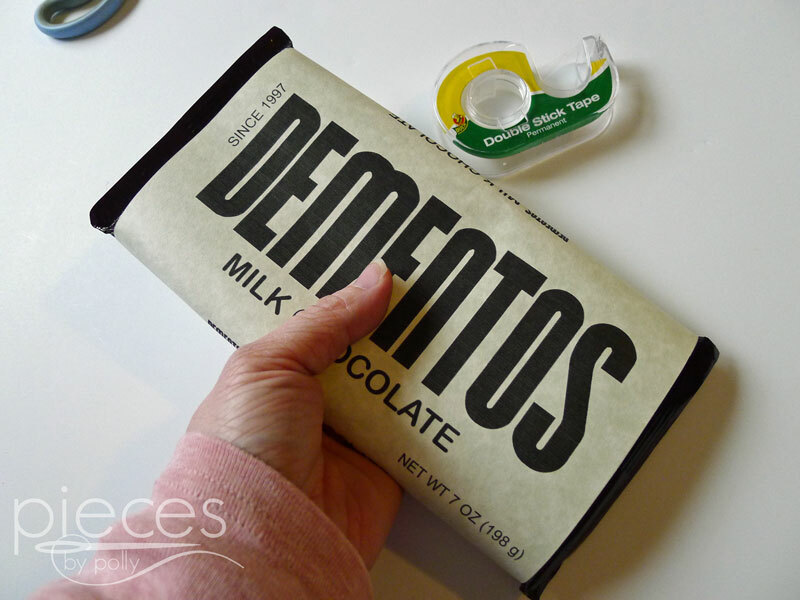 Dementos is available for the XL and Giant size Hershey Bars. Let me know in the comments which design is your favorite, and I'll work on getting the most popular one available for all the sizes. 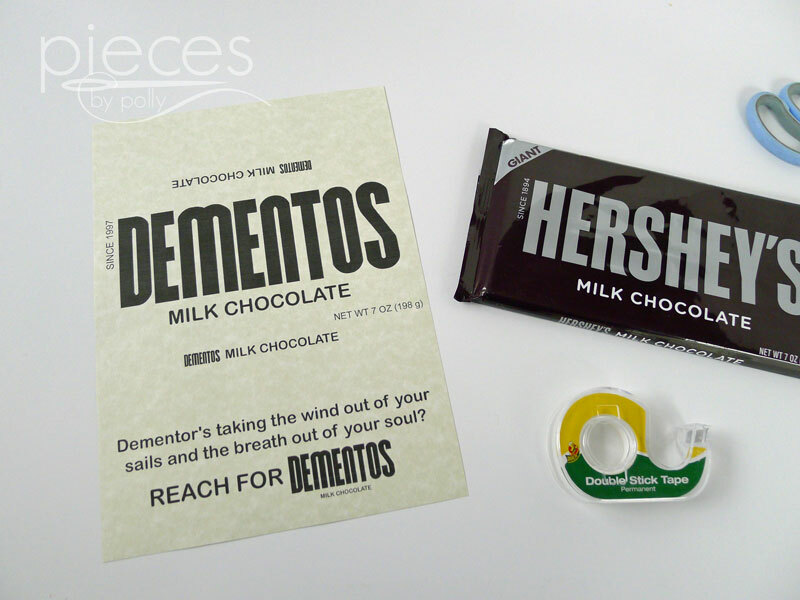 Dementor Relief Wrapper Printable (Two sizes...One fits regular Hershey and Nestle bars, and the other fits Hershey's with Almonds) Be sure when you're printing this one that it's printing in LANDSCAPE format. 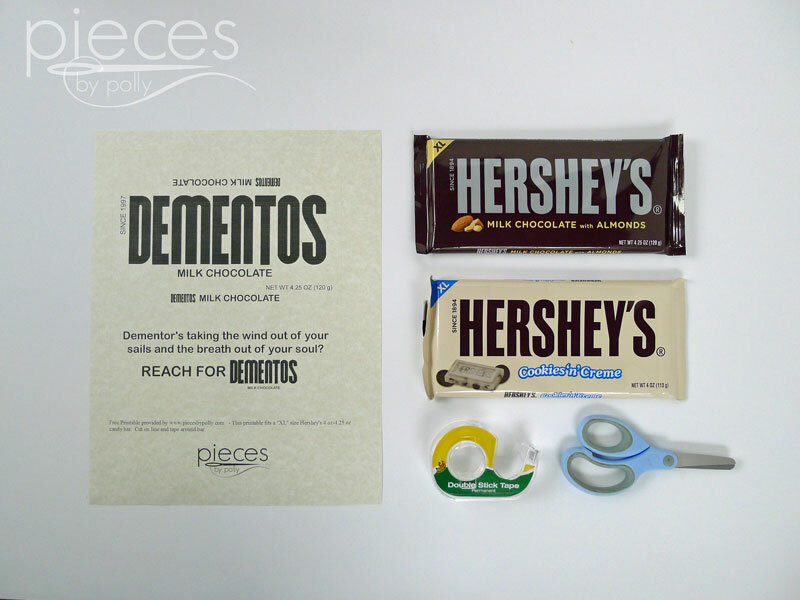 Dementors Revenge Wrapper Printable (Two sizes...One fits regular Hershey and Nestle bars, and the other fits Hershey's with Almonds) Be sure when you're printing this one that it's printing in LANDSCAPE format. 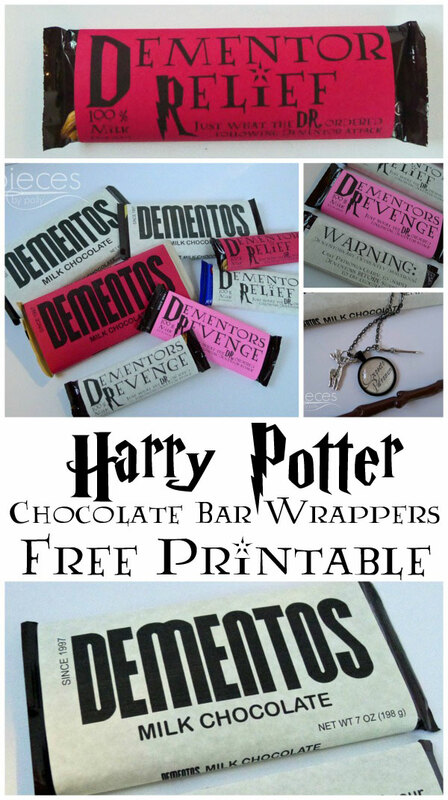 Start by printing out the wrappers. You should be able to do it by clicking on the links above and printing directly from Google Docs. I used colored paper and some parchment paper, but white paper will work fine too. 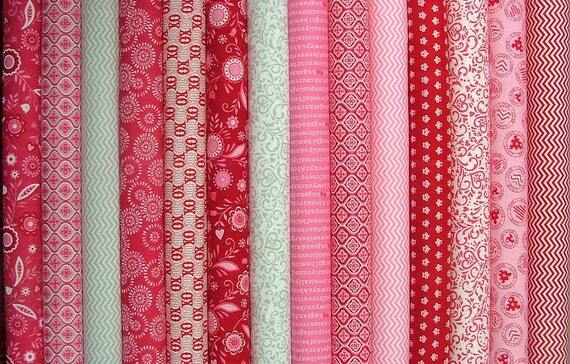 If you're making several, try printing one first to make sure it prints the right size. I made the cut line really faint, so it won't show when you're finished. 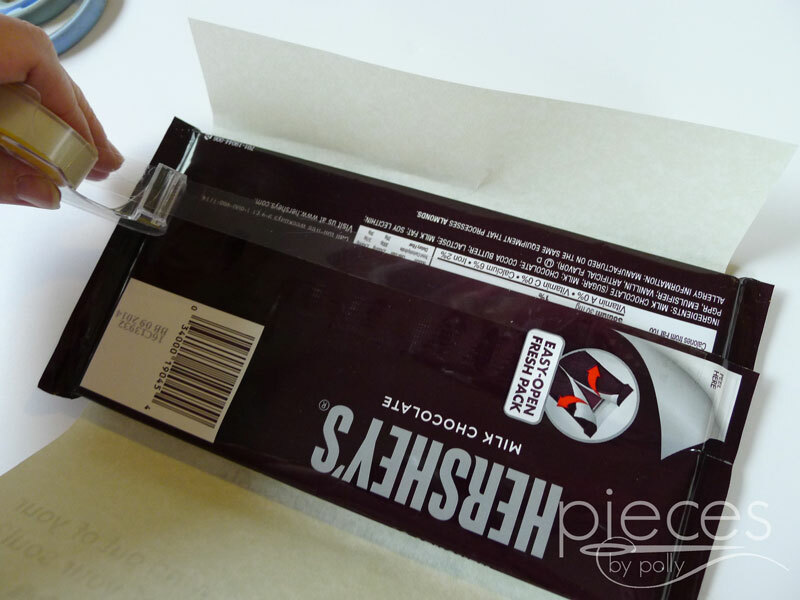 Wrap the paper around your candy bar to check for fit. 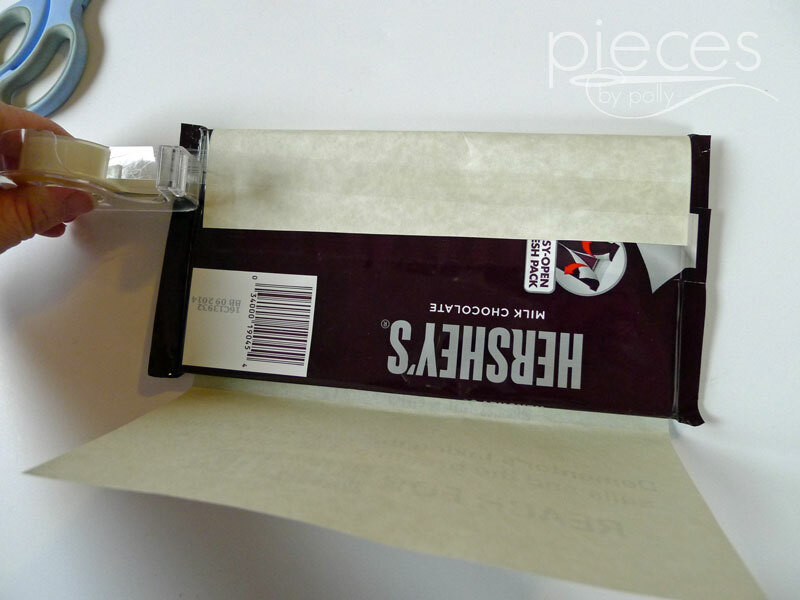 Then put a strip of double sided tape on candy bar where the wrapper needs to go. 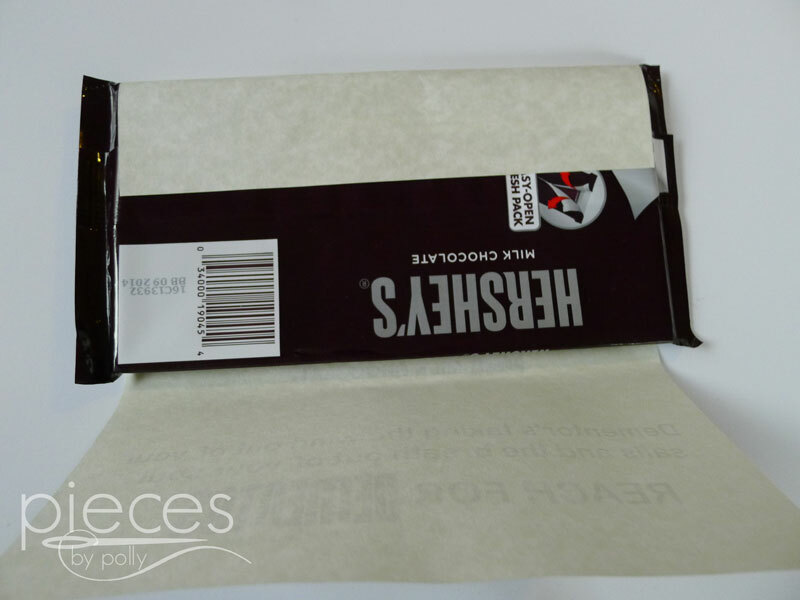 Add double sided tape directly to the back of the candy bar (although you can apply it to the paper instead if you wish). Add another strip of tape and finish. 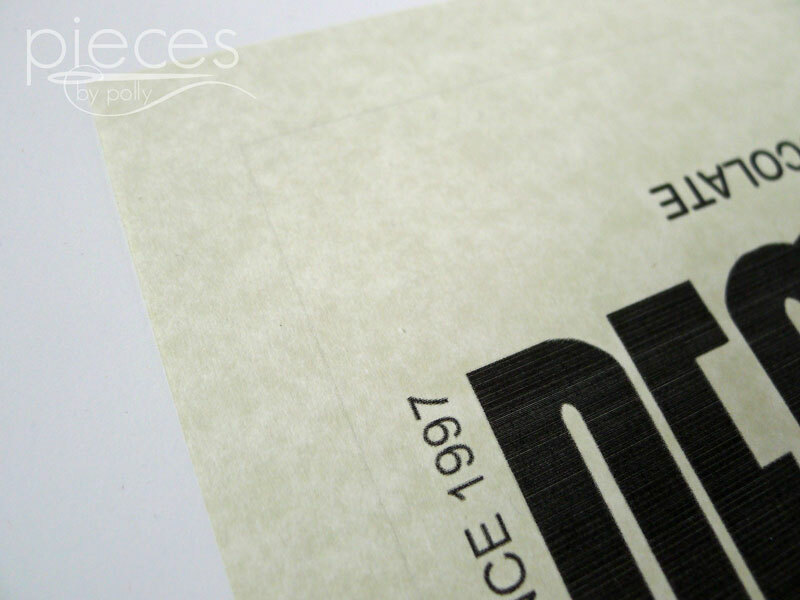 It's also possible to just use one strip of tape, so that the wrapper is free to rotate, and that can be handy for fine tuning the placement. You can also use regular scotch tape, but the tape will show slightly. And once I finished up with these, it got me thinking surely there's something fun that could be done with Hershey kisses...so maybe I'll have that for you soon. 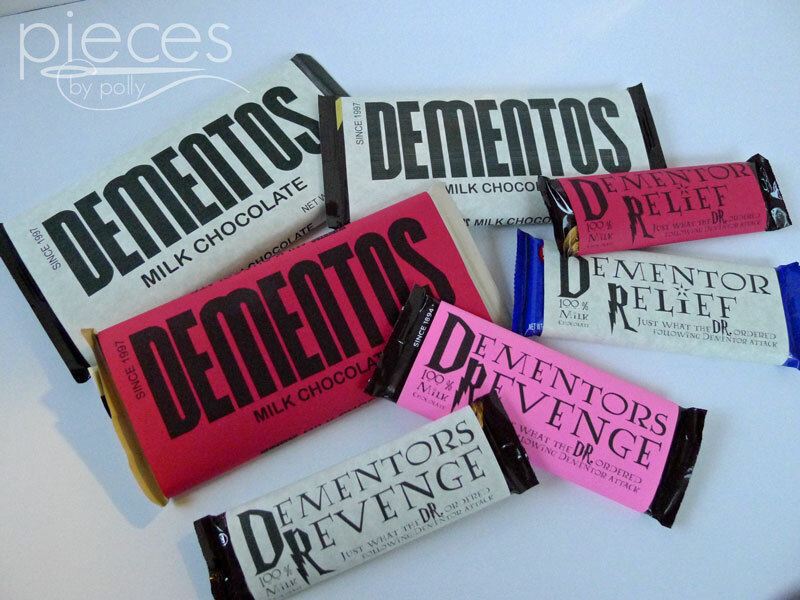 Of course, chocolate will help you get over the feelings of despair that dementors leave in their wake...but they won't actually break-up a full blown dementor attack. 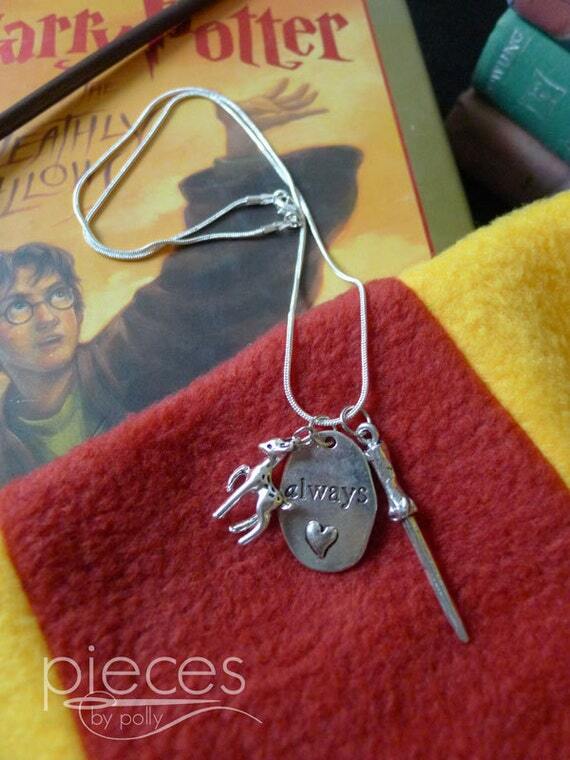 For that you'll need to cast a patronus charm. 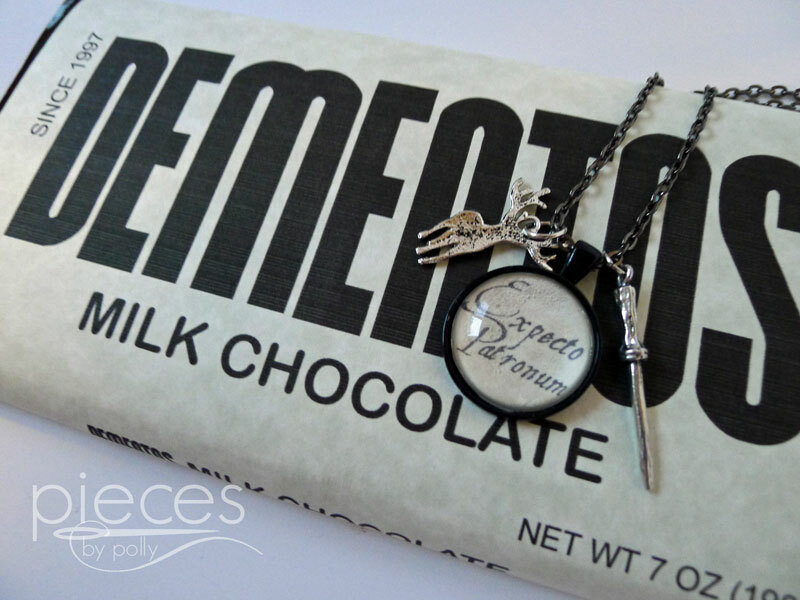 We're told in the Harry Potter books that only very powerful witches and wizards are able to cast a corporeal patronus...but now you can carry one around your neck. 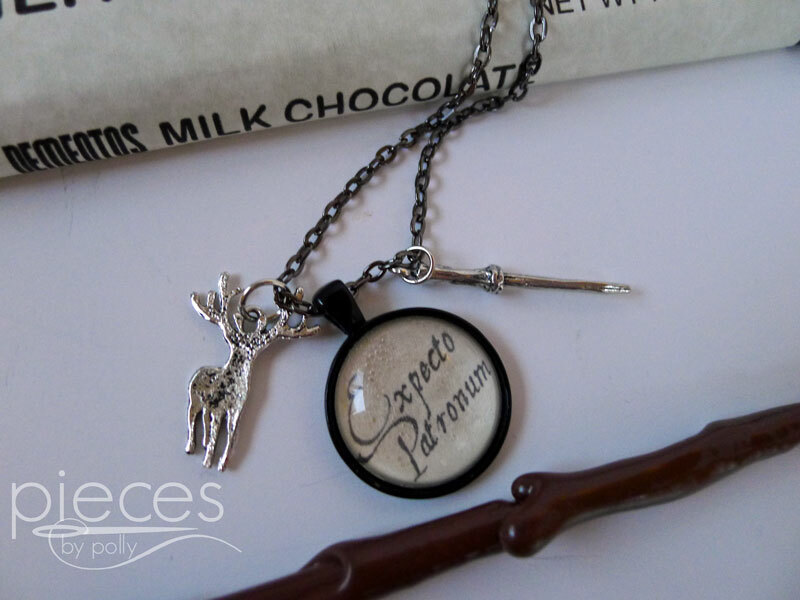 I now carry Expecto Patronum necklaces along with a number of other Harry Potter inspired items in my Etsy shop. And the best part? You can pick your own patronus. I've got lots of animal charms to choose from, so you can pick the one that represents you best. 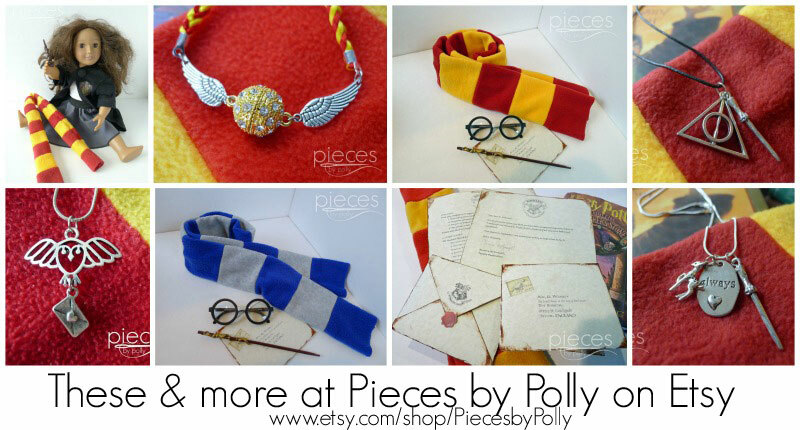 Polly this is such an awesome idea! And it sure was fun to be part of the "development" process! This is so darling! Is there any chance you might make this available for fun or snack-size candy bars? 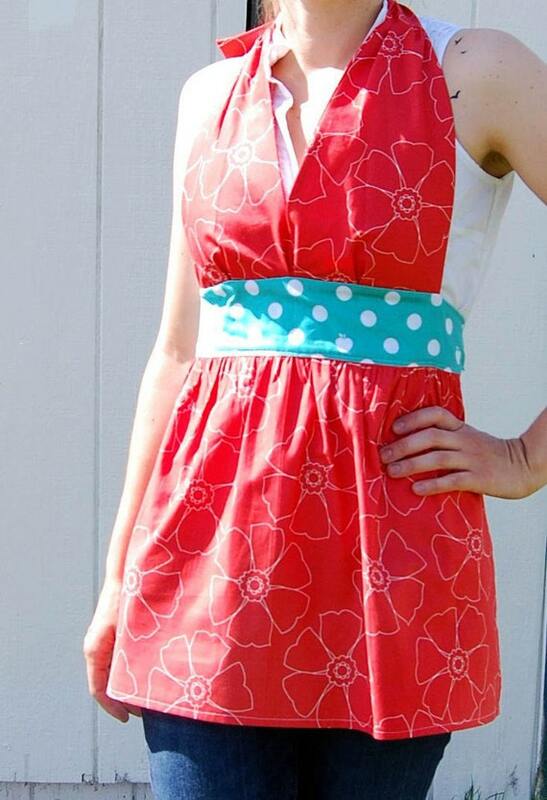 You said you used colored paper and parchment paper. How exactly did you do that? It's was paper that I bought that was regular printer paper size, although you could cut larger paper down to size if you needed to. These are really cool! I am using the Dementor Relief and Dementors Revenge for my daughter's 6th birthday party this weekend. They look AWESOME! 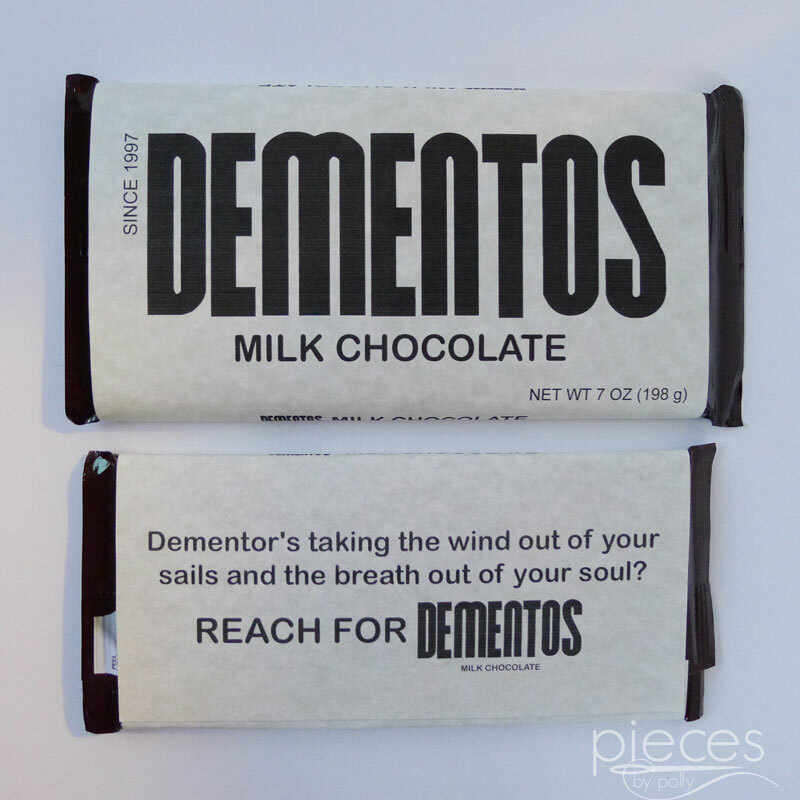 FYI - on the back of the Dementos wrapper, the text should read "Dementors taking the wind..." as it's plural, not possessive.